Originally built in Second Empire with French Mansard roof. Park Street was constructed in 1873. This building was built about 1874 - 1875. It was built in the new Second Empire or French Empire style with a Mansard roof and three window dormers on the front facade. The business block was built as rental property. The deeds are somewhat vague and we now know believe the deed line comes through Moody Russell to Erwin C. Pike on Nov. 7, 1881. The land was once part of the Col. Benjamin Abbott homestead that was located on the corner of Main and Park Streets. His front yard extended to Barnard St. and included the Old Town Hall site and most of the parking lot behind it. Abbott's property was acquired by Wm. Phillips Foster prior to Ben Abbott's death in 1852. This land was on the east side of the brick house.and most likely held a barn at one time. Foster held several properties in 1850 including the Elm House and stables and this Brick house, with 1 1/4 acre of land and stable valued at $4000. in 1850. Foster sold off the front yard to the Town of Andover April 10, 1858 for construction of the Town Hall. The lot was 100' on Main St. East 372' along what is now Park St. South 95' to Shedd land then west 416.5' to the first bound. W. P. Foster died February 24, 1871 at the age of 41. His estate was settled the following year. 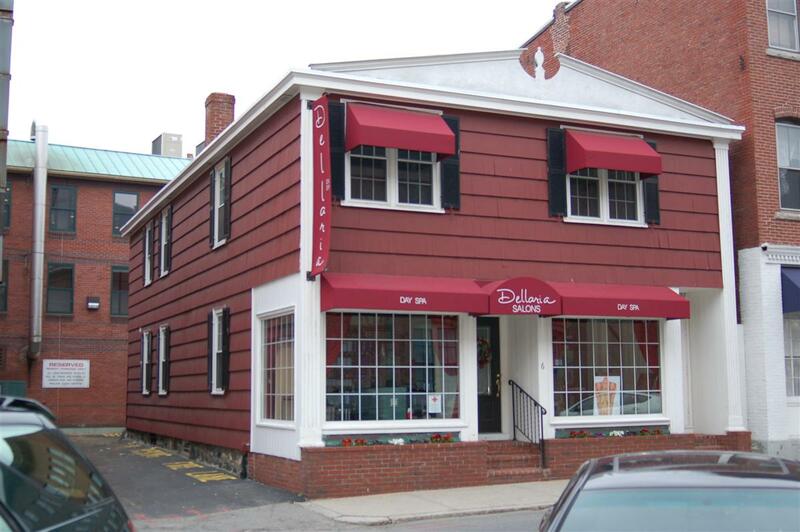 The brick house, land and out buildings were then sold for $6000 to Charles W. Woodman of Dover, NH on March 22, 1872. 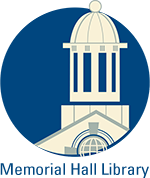 The Andover Advertiser reported March 15th – Samuel Woodman has purchased of the executors of the will of the late W. Phillips Foster, the estate next north of the Post Office, known as the Col. Abbott place. There was a lease to John H. Flint and John Cornell, to be terminated by us, executors of Foster’s estate, on June 10th, next. Samuel Woodman moved his furniture business from #2 Main Street, purchased from Joseph Abbott in October 1871, to this location above the Valpey Brothers Market in Jan. 1872. His door was located on the Park Street side of the building. In March he entered into a partnership with James Crabtree and purchased of the estate of late Herman Abbott, his undertaker and coffin materials business. Advertisements list Woodman & Crabtree. Orders at Woodman’s store or his house, third house south of Town Hall. 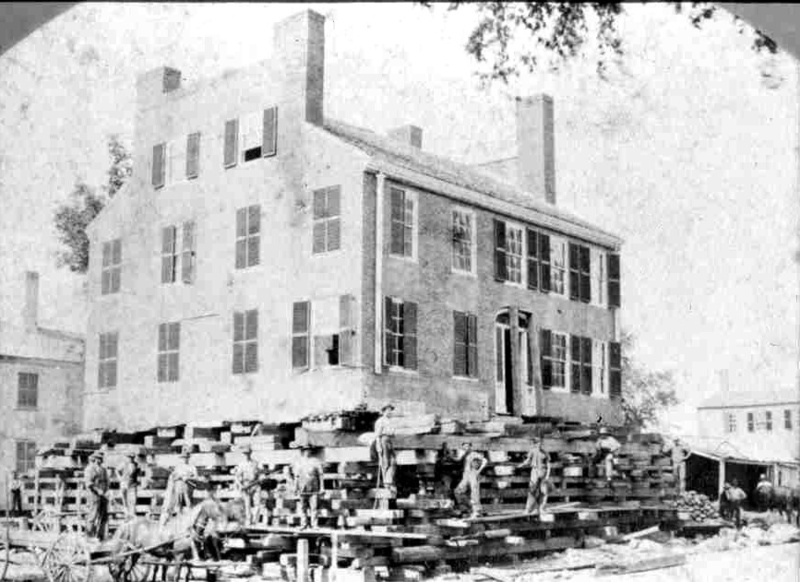 July 5, 1872 –AA- Mr. Samuel Woodman is soon to erect a wooden building 80 x 25 feet, three stories, on Main Street between the brick block he recently purchased of the estate of W. Phillips Foster, and the town house. It is intended for his furniture business, including upholstery, painting, repairing and storage, with probably some rooms to let. It will have a handsome finish in front. September 1, 1872 - Mr. Woodman is putting in the foundation for his new building next north of the Town house. Oct. 3, 1873 AA – James Crabtree has purchased the interest of Sam Woodman, in the late firm of Woodman & Crabtree and will carry on the undertakers business in its various branches at the old stand. March 13, 1874 AA Mr. Woodman is removing the wooden part of his building on Main Street to a location on Park St. next to Crabtree’s undertaker shop. Woodman announces in April plans to sell the brick house at auction in the months ahead. April 24th Samuel Woodman is fitting up his wooden building on Park Street for a shop and tenement. On June 5, 1874 Moody Russell purchased only the lot with the brick house for $2985. The new deed however allowed for “Samuel Woodman, who may occupy the premises free of rent until till the 1st day of next July”. The lot began 30' east of his Brick Block on Park St. then north 54' to Pray lot, west 82' to Main St. south 52’ on Main Street and 82’ deep along Park Street to the first boundary. Moody Russell wasted little time in beginning alterations to the brick building. The front ell was removed. The store space that had occupied the basement must have required patrons to step down off the sidewalk level. By raising the building four feet the floors could be lifted to street level, ceilings would be about eight feet high and larger windows inserted for display and light to the interior space. Russell sold half his interest in the property on February 12, 1876 to Jacob W. Barnard for $3500. 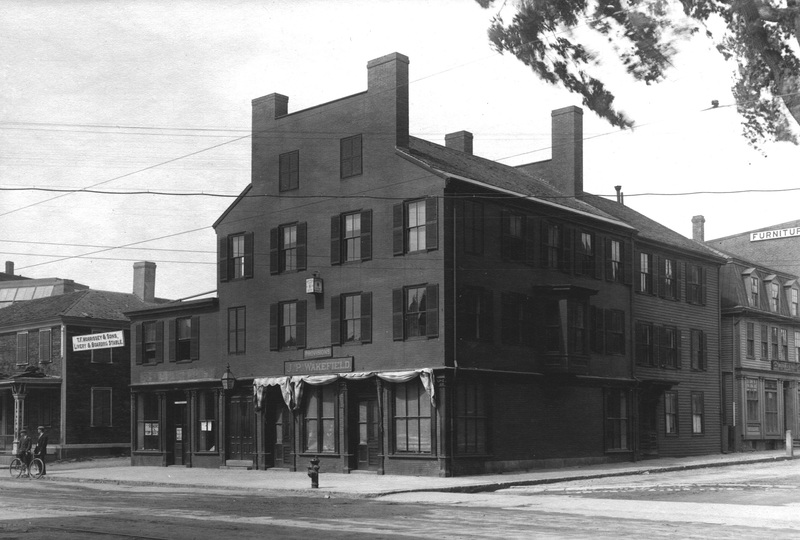 Barnard was in the shoe manufacturing business and had begun investing in real estate properties in the town center. Charles W. Woodman however held on to the remaining lot east of the brick house on Park St. He sells two parcels. The first to John Cornell on Oct. 10, 1873 for $1000. which was further east on Park St. where the Buchan & McNally building now stands and had 170' fronting on Park. The second parcel was sold to Theodore C. Woodman of Bucksport, ME on April 20, 1875 for $1321.71. The parcel contained a shop and tenement building. No specific dimensions were given in the deed, only bounded on the north by Pray, east by J. Cornell, south by Park St. and west by Russell. Theodore Woodman then sells a 30' strip of land on Park St. to Moody Russell for $800. on May 14, 1875. 30' on Park, north by Russell. Feb. 25, 1876 AA – Moody Russell is erecting a new wooden building on Park Street, opposite the town hall. It is 21 x 40 feet, two stories. 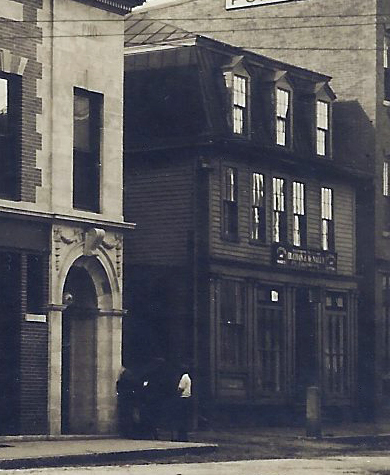 Feb. 4, 1876 AA – Thomas Howell has purchased of T. C. Woodman a lot of land on Park Street, opposite the town hall. Mr. Howell will erect a building on the lot for furniture and upholstery rooms. It will be 50 x 32’ feet, two stories. Pearson & Bros. of Methuen, Nov. 1874-1875 for tin ware and stove business. They sold to Edwin (Erwin) C. Pike est. 1872. Pike built a new three story building on Park St. moving there in 1875. George Saunders established his tin, stoves and plumbing business in 1888 in the Barnard Block but later relocated to the two story addition at #12 Main until 1910. Erwin C. Pike purchased the building on Nov. 7, 1881 for $1800. March 3, 1876 AA – Mr. E. Pike has removed to the new commodious building on Park Street, opposite the town house, where he keep a full line of stoves, together with tin, wooden, glass and other wares in great variety. Removal – The subscriber gives notice that he has removed his stock and trade to Russell’s new building on Park Street, opposite the town hall. The stock consists of a large quantity and great variety of Stoves, Tin, Glass, Wooden and Britannia Ware, and other household articles, which will be sold cheap. Repairing done at short notice, and on reasonable terms. E. Pike - Andover, March 31, 1876. Sept. 15, 1905 AT - New Plumbing Firm – Plumbing business and stock owned by E. C. Pike, recently purchased by B. Rogers & J. H. Campion, now in the hands of John S. Buchan & Joseph W McNally. The firm will be known as Buchan & McNally – gives a short history. Buchan & McNally plumbers were located here in 1910 as the signs over the front door in the period photo proclaim. In the 1950's the building was the home Walters' Cafe and of the DAV 18 Veterans Club above. City Cleaners relocated to the first floor from the former Draper Building on Main St. that was raze in 1957. City Cleaners opened the new store on Feb. 28, 1957. 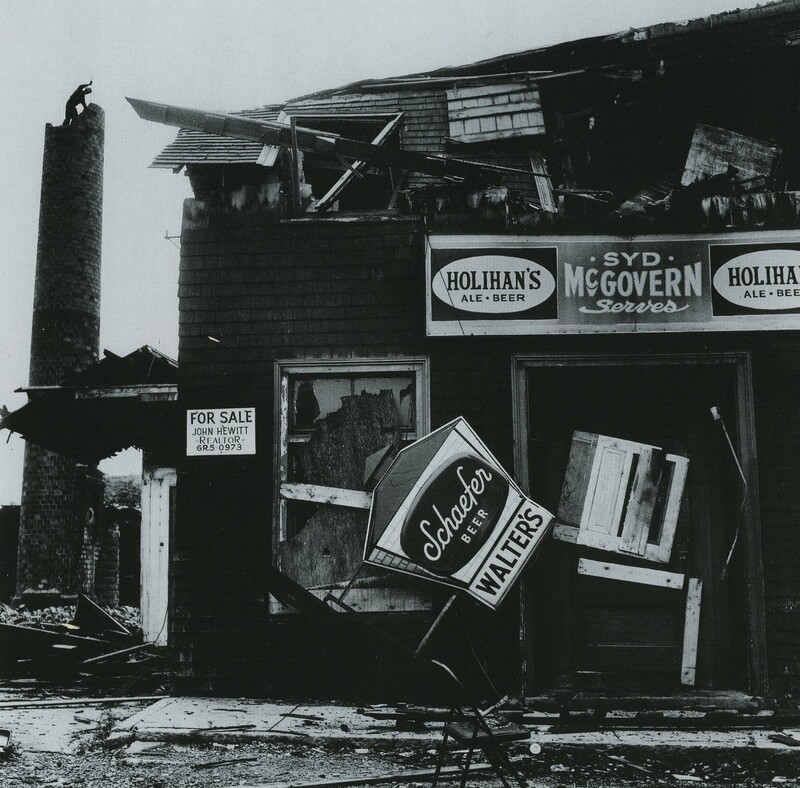 On New Year's Eve, Dec. 31, 1957 a fire broke out and the building was heavily damaged. The Mansard roof was destroyed and removed. The main body of the building survived the blaze. The shallow gable roof replaced the former Mansard and the entire structure was remodeled. City Cleaners relocated to 42 Park St. opening again on July 31, 1958. In the 1970's and early 1980's a bar called "Shagg's Bar & Grill" occupied the first floor. When the bar closed the store was occupied by Hunneman and Company Real Estate Co. in 1992. 1953 - 1957 - Walter's Cafe, Inc.
Major Alterations Mansard roof replaced after fire on Dec. 31, 1957, Front facade updated, second floor windows replace by two doubles. Andover Townsman Dec. 31, 1957 rear view of 8 Park St.
January 1958 - Walters Cafe. Brick chimney to rear was Andover Steam Laundry on PO Ave.